Subscribe to get deals from hundreds of merchants including the best of Café Swiss, Swissotel The Stamford! Promotion Period: 01/12/2018 to 30/12/2019. Promotion is valid for dine-in only.. Please quote “DBS / POSB Dining Privileges” at the time of booking.. Promotion is valid with advance reservations only. For enquiries and reservations, please reserve online, call +65 6431 6156 or email dining.singapore@swissotel.com.. Promotion will be applicable for a maximum of 10 guests/ adult diners per table, per visit. The discounts are not applicable on kid’s menu.. Swissotel The Stamford reserve the right, at their reasonable discretion, to vary, add to or delete the Promotion terms and/or terminate the Promotion at any time.. DBS General Promotions Terms & Conditions apply, please refer to www.dbs.com.sg/dbscardstnc.. . Please always check with the merchant on the validity of the promotion before purchase. Please quote “DBS / POSB Dining Privileges” at the time of booking. Promotion is valid with advance reservations only. For enquiries and reservations, please reserve online, call +65 6431 6156 or email dining.singapore@swissotel.com. Promotion will be applicable for a maximum of 10 guests/ adult diners per table, per visit. The discounts are not applicable on kid’s menu. Swissotel The Stamford reserve the right, at their reasonable discretion, to vary, add to or delete the Promotion terms and/or terminate the Promotion at any time. Applicable to lunch & dinner buffet.. The Promotion period is from 1 October 2018 – 30 December 2019 (both dates inclusive).. To utilize the promotion, the Citibank Debit/Credit card must be presented upon payment and full payment must be charged to a Citibank Debit/Credit card in a single receipt.. All prices are subject to a service charge and prevailing government taxes, unless otherwise stated.. Promotion is valid for dine-in only.. Promotion is valid for a la carte food items only, unless otherwise stated.. Promotion is valid with advance reservations only.. Promotion is not valid on the eve of public holidays and on public holidays.. Promotion will be applicable for a maximum of 10 guests per table, per visit.. Promotion is not valid in conjunction with other discounts, promotions, privileges and/or offers.. Citibank's decision on all matters relating to the Promotion will be determined at its reasonable discretion and is final and binding on all participants.. Citibank shall not be responsible for the quality, merchantability or the fitness for any purpose or any other aspect of the products and/or services provided by third parties and Citibank shall not at any time be responsible or held liable for any loss, injury, damage or harm suffered by or in connection with the products and/or services provided by third parties. All disputes about quality or performance of the product and/or services shall be resolved directly with Fairmont Singapore, Swissotel The Stamford.. Citibank and Fairmont Singapore, Swissotel The Stamford reserve the right, at their reasonable discretion, to vary, add to or delete the Promotion terms and/or terminate the Promotion at any time.. "Citibank" refers to Citibank Singapore Limited and "Fairmont Singapore, Swissotel The Stamford" refers to RC Hotels (Pte) Ltd.. . Please always check with the merchant on the validity of the promotion before purchase. Applicable to lunch & dinner buffet. The Promotion period is from 1 October 2018 – 30 December 2019 (both dates inclusive). To utilize the promotion, the Citibank Debit/Credit card must be presented upon payment and full payment must be charged to a Citibank Debit/Credit card in a single receipt. All prices are subject to a service charge and prevailing government taxes, unless otherwise stated. Promotion is valid for a la carte food items only, unless otherwise stated. Promotion is valid with advance reservations only. Promotion is not valid on the eve of public holidays and on public holidays. Promotion will be applicable for a maximum of 10 guests per table, per visit. Promotion is not valid in conjunction with other discounts, promotions, privileges and/or offers. Citibank shall not be responsible for the quality, merchantability or the fitness for any purpose or any other aspect of the products and/or services provided by third parties and Citibank shall not at any time be responsible or held liable for any loss, injury, damage or harm suffered by or in connection with the products and/or services provided by third parties. All disputes about quality or performance of the product and/or services shall be resolved directly with Fairmont Singapore, Swissotel The Stamford. Citibank and Fairmont Singapore, Swissotel The Stamford reserve the right, at their reasonable discretion, to vary, add to or delete the Promotion terms and/or terminate the Promotion at any time. "Citibank" refers to Citibank Singapore Limited and "Fairmont Singapore, Swissotel The Stamford" refers to RC Hotels (Pte) Ltd. Valid from 1 October 2018 to 30 December 2019. Quote "Maybank Dining Privileges" at the time of booking a table. Advance reservations are highly recommended. Valid for dine-in only for a maximum of 8 adults diners per visit. The Hotels reserve the right to vary any of these terms and conditions, or to withdraw this Promotion, at any time in their discretion without prior notice. For enquiries and reservations, please reserve online only at www.swissotel.com/hotels/singapore-stamford/dining. Alternatively, call +65 6431 6156 or email dining.singapore@swissotel.com. Maybank TREATS General Terms and Conditions apply. Please always check with the merchant on the validity of the promotion before purchase. Discounts do not apply to government taxes and service charges.. Usual member reductions are not valid for banqueting, take-out services, outside catering, private dining including Equinox private dining.. Usual member reductions are applicable for maximum 10 people dining in the participating restaurants, the 11th guest and above will have to pay full price.. 50% discount is only applicable when there are 2 adult diners at a table subject to the following additional conditions for each outlet:. For Equinox Restaurant, a minimum order of 2 main course items is required for the 50% discount to be applicable.. For other restaurants, a 50% discount is only applicable when there are two (2) adult diners at a table with minimum 2 food items ordered (e.g. one set menu and one starter or one main course and one starter). In the event that only one food item is ordered for sharing and there are 2 diners at the table, a 10% discount will apply.. Members and their diners have to order a dish each in order to enjoy the varying discounts.. Only one (1) membership card can be used per table or party, per visit, and the member must dine at the table to enjoy the membership benefits. Hotels can request for identity verification at any time.. No splitting of bills will be allowed in case there are two or more members dining at one table.. Hotel may restrict seating availability at specific restaurants during high occupancy. An allocation will be made for The Far Card members. Advance reservations quoting your membership number will be required. Tables may not be available to members in selected restaurants in the event the allocations. for members have been taken up.. Meal periods, menus, prices, change of concept and operating hours can change during the year.. Usual The Far Card member privileges may not apply during monthly guest chef promotions and other seasonal promotions at restaurants. However, the hotel might, at its discretion apply a flat discount. Advance reservations are required during promotions and high occupancy at restaurants as hotels may restrict seating availability.. Members are entitled to a 25% off in-room dining benefits. Member must be present, show their membership card, and inform the order taker of membership number so the bill is accurate.. Please always check with the merchant on the validity of the promotion before purchase. Café Swiss is situated inside Swissotel The Stamford which is famously known for their mouth watering dishes and exquisite cuisine. Unlike any other Singaporean restaurants, Café Swiss takes pride in their authentic Singaporean favourites made delicately. But, what makes it so unique from the others is that it offers more than just Singaporean dishes, it is also widely known for its fine selection of international delicacies. 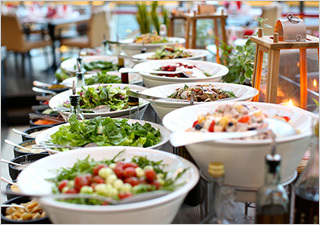 At Café Swiss, you can not only enjoy scrumptious foods, but you can also experience the charming Swiss hospitality. The café’s sophisticated interior design accentuated with modern, stylish accents offers a perfect atmosphere for a power breakfast, casual business lunch or even pre-theatre dinner. Not only that, illuminated by an overhead natural skylight, Café Swiss radiates an inviting aura of warmth and elegance for a tranquil respite. Nothing will be as comfortable discussing business agendas with your clients, bosses or partners than dining and sharing a feast at Café Swiss. People who love Swiss food will also have a good time eating at Café Swiss with their sumptuous cheese delights, pasta dishes, fondue treats and baguette verities. Seafood lovers can also indulge with their must-try Italian Venus Clams and Japanese Scallops. And of course, delectable desserts await you to satisfy your cravings. Indulge with an overflowing sweet taste of luscious cakes, tarts and puddings. Your imagination is only the limit! Choose from our scrumptious wide selection of desserts including Mont Blanc Chestnut Pear Cake, Linzer Torte, Raspberry Green Tea Chiffon and of course their very own version of raclette. The café’s international dishes are not only limited to Swiss, German, Italian and French cuisine, but they also serve Japanese favourites. Asians can get to experience home again by serving them palatable varieties of sashimi, sushi, maki, and Oriental delicacies like soba and somen noodles seasoned with traditional condiments. Add that with a live roasting station, and voila – perfect deals for making your taste buds explode with satisfaction! It is no surprise that the restaurant is always a full house and is visited not only by the locals but also by the tourists. Café Swiss has been immensely popular over the years for their extensive buffet lunch and dinner that offers a variety of European fare. As such, Café Swiss had joined the line of the most reputable cafes across the city of Singapore. Their extensive promos never fail to make their customers happy and craving more. Of course, your visit to Café Swiss would not be complete without trying their signature meal, Natural Jus Chinese Herbal Braised Beef Shank and Roast Duck Breast with Braised Savoy Cabbage. If you want to experience a serene dinner date with your loved ones, then this is the right place. Share a meal with your partner under the starry night sky of Café Swiss and let the evening unfolds itself. You can avail breakfast feast daily every 6:00 – 11:00 in the morning. Lunch buffet is served Monday to Friday every 12:00 – 2:30 pm and dinner buffet is ready to be served only on Thursday to Saturday every 6:30 – 10:00 pm. Café Swiss is located at 2 Stamford Road, Swissôtel The Stamford, Singapore 178882. For reservations, please call +65 64316156 or email us at dining.singapore@swissotel.com. To know more about Café Swiss, visit their website.